Today included so many spur-of-the-moment experiences. I love controlled spontaneity. Yes, I do understand the oxymoron…but let me explain. I am extremely type-A, enjoy the comfort of a fully-planned outing, maintain a class binder for each course [which contains all notes, assignments, exams and course expectations] and even look up movie times before we head out, which goes completely against my fly-by-the-seat-of-his-pants boyfriend’s ideas of living life. So, I’m a bit of a square. What of it? 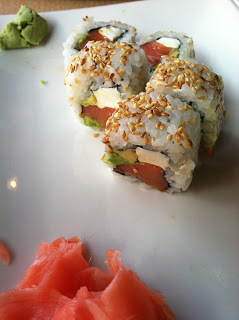 You must be wondering about the sushi…well, that’s part of my impromptu outing. I ended up having to drive up to Fort Worth from Baylor and was reaaaaallly hungry when I made it up here. Thankfully Angel (my wonderful boyfriend) skipped his lunch to be able to meet with me! He’s so very sweet and I adore him! Anywhositwhatsit – we went out to lunch and he was craving Orange chicken, of all crazy fried things. Now, we are both watching our calorie intake and I’m even following WW‘s points plan. He, however drinks two meal replacements a day, which leaves about 1000 calories for him to consume at lunchtime. He also burns a minimum of 1000 calories per day through his crazy-ab-ripping workouts. Since I am only on day three of this new adventure, I figured it would be perfectly “fine” to indulge in an awesome beef and broccoli dish, I mean – there is BROCCOLI in it! My inner food fairy started shrieking and nagging me to find a healthier option, because – are you ready for this – I couldn’t help but remember the bank agent who called me today to alert me of fraudulent activity on my card. Was somebody buying 800 tennis balls? No. Did they reserve an expensive hotel room and order bottle service? No. Instead, they flagged my account for having purchased my WW membership. The agent was so very kind while she told me “Well, honestly – you’ve never been a health and fitness body, according to your purchases. It seemed highly speculative.” Gee, thanks for being so judgy. This woman’s surprise at my choice in leading a healthier lifestyle kept ringing in my ears, so I was able to step away from the (what probably was quite tasty) beef and broccoli, and instead chose to get a Philadelphia roll. My entire point? I am committed to this change. It’s so very easy to fall off the plan and indulge. The problem with that ingenious way of thinking is that I tend to forget how many pointless calories I’m taking in. Me, the coffee aficionado and lover of all things mountain dew. Kit Kats and Doritos used to be my study snack of choice and an apple would be lucky, to reserve a spot within my fridge. All of that is different now. I’m changing up my own game and finally taking control of my choices, instead of following the pizza crowd. It may seem small, stupid even – but this realization is so very great! I can’t blame anyone for stressing and filling the stress-holes with cheesecake or oreos. All of that is my fault and I am on my way to fixing this somewhat-mess. I’ve got fifty pounds to go and am excited for my weigh-in on Sunday. Bring it on, you puny little scale. I’ve got this! I'm so proud of you bunny boo for making the healthy choice. Taking on what you're doing is a lifestyle change. I have complete faith that you can do it. LOVE YOU.